Acid Mine Drainage and Art Project (1994-2005) was a community enhancement initiative in Western Pennsylvania to bring broad public participation to the construction of treatment systems to clean up Acid Mine Drainage to create enjoyable, educational, park-like community landscapes. 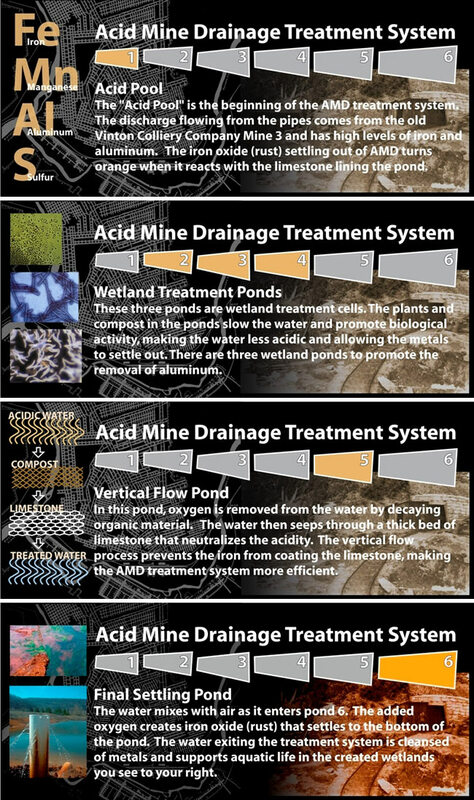 Acid Mine Drainage (AMD) is the outflow of metal laden and acidic water which seeps out of abandoned coal mines and coats stream beds with orange sediment, desolating whole watersheds. A sequential, three-site project blended community history, innovative science, responsive landscape design and active community participation to restore AMD polluted water to a life-sustaining level. To reach this goal abandoned mine lands and discharges were reclaimed and transformed into parks and wetlands that actually help to improve the water quality. AMD&Art provided a forum for community discussion, action, and cultivated community involvement. Project Director Allan Comp, received a fellowship appointment and engaged with the STUDIO for Creative Inquiry in the early stages of the project. Three sequential project sites east of Pittsburgh were chosen by AMD&Art to be transformed into parks and designed to be sustained by local resources. Each site fulfills a specific role, progressing from a small pilot project to a large discharge central to the community. Vintondale was the Pilot Project and the chance to show the community the design advantages due to its heavily traveled rail trail with high visibility. Second was the Hughes Bore Hole, a site which provided a challenge on both scientific and interpretive fronts. 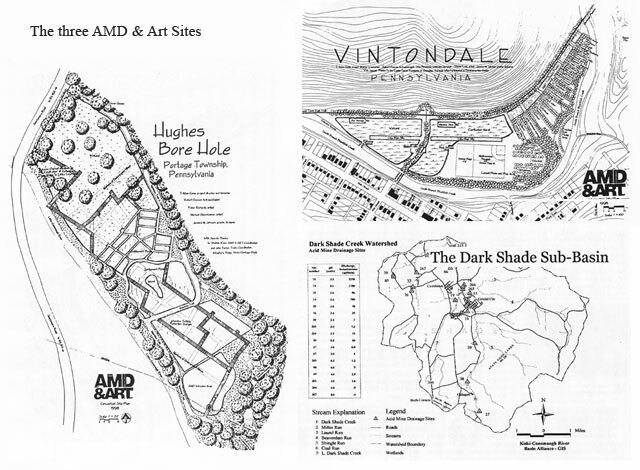 Finally, the Dark Shade sub-basin, where AMD&Art and a host of partners were engaging an entire watershed to prove that this approach can work on the scale necessary to effectively deal with acid mine drainage as a watershed problem and a regional solution.